IASTM aka “Instrument Assisted Soft Tissue Mobilization,” is a manual therapy approach to musculoskeletal injuries using specifically designed tools. 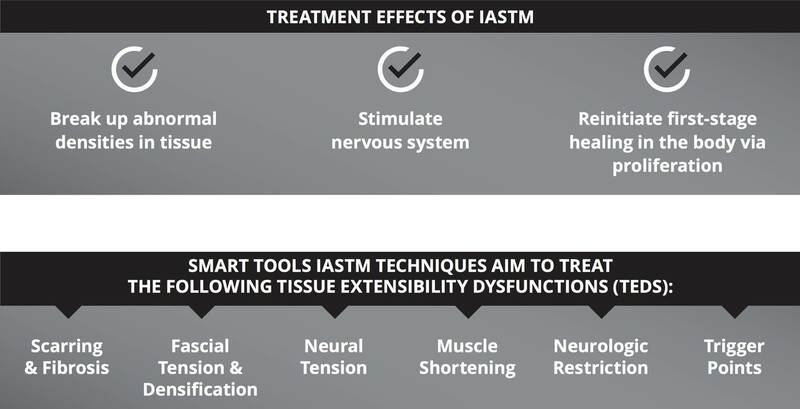 The most effective material for IASTM is stainless steel, which Smart Tools are comprised. Smart Tools were developed to assist in effective treatment of adhesions and scarring brought on by surgeries, injuries, and overuse of muscles. Our tools will assist medical doctors, osteopathic doctors, chiropractors, physical therapists, physical therapy assistants, occupational therapists, athletic trainers, massage therapists, acupuncturists, and others to effectively treat patients with less fatigue to the practitioner. We have experimented with various tools and are confident the Smart Tools will provide years of satisfaction at a fraction of the cost of comparable products on the market. Our use of precision machining creates an unrivaled contact with the skin surface and the tool to transmit a unique vibration, which helps isolate the troubled area. The medical grade stainless steel, polished to a mirror- like finish, allows the use of topical solutions to be used without any risk or damage the tools. This will enable the practitioner to create a controlled inflammatory process, which will allow the tissue to begin the healing process, breaking down scar tissue/adhesions in the troubled area, and accelerate the recovery process.